In 2012, after eight seasons with Orlando, Howard was traded to the Los Angeles Lakers. After one season with the Lakers, he played for the Houston Rockets, the Atlanta Hawks, and the Charlotte Hornets before joining the Wizards in July 2018. On April 18, 2019, Howard exercised his $5.6 million player option to play a second season with the Wizards. Standing at 6 feet 11 inches tall (2.11 m) and weighing 265 pounds (120 kg), Howard plays the center position. Howard led the NBA in rebounding from 2007 to 2010, and again from 2012 to 2013. Howard's rebounding is in part facilitated by his extraordinary athleticism; his running vertical leap was tested at 39.5 inches in 2011, rare for a player of his size. He demonstrated this skill in the 2007 Slam Dunk Contest, where he completed an alley oop dunk from teammate Jameer Nelson while slapping a sticker onto the backboard at 12 ft 6 in (3.81 m) high. The sticker showed an image of his own smiling face with a handwritten "All things through Christ Phil: 4:13", a paraphrase of Philippians 4:13. Howard's abilities and powerful physique have drawn attention from fellow NBA All-Stars. Tim Duncan once remarked in 2007: "[Howard] is so developed... He has so much promise and I am glad that I will be out of the league when he is peaking." Kevin Garnett echoed those sentiments: "[Howard] is a freak of nature, man... I was nowhere near that physically talented. I wasn't that gifted, as far as body and physical presence." Subsequent to a game in the 2009 NBA Playoffs, Philadelphia 76ers swingman Andre Iguodala said: "It's like he can guard two guys at once. He can guard his guy and the guy coming off the pick-and-roll, which is almost impossible to do... If he gets any more athletic or jumps any higher, they're going to have to change the rules." 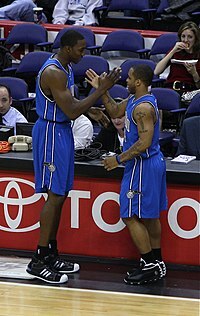 In December 2007, ESPN writer David Thorpe declared Howard to be the most dominant center in the NBA. Early in his career, many sports pundits rated Howard as one of the top young prospects in the NBA. Howard has a reputation as a negative locker room presence. 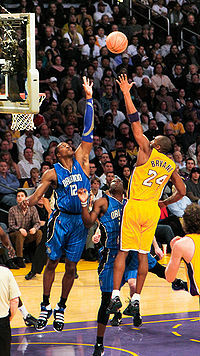 ^ a b c Dwight Howard Info Page – Career Stats and Totals, nba.com, accessed December 5, 2007. 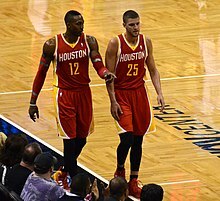 ^ "Dwight Howard exercises player option, will return to Wizards for the 2019-20 season". www.washingtonpost.com. Retrieved April 20, 2019. ^ ESPN Sport Science: Superman, espn.go.com, November 3, 2011, accessed November 4, 2011.